Jan Beatty is the host and producer of Prosody. Beatty is the author of four books of poetry: The Switching/Yard (2013), Red Sugar (2008), Boneshaker (2002) and Mad River (1995), all published by the University of Pittsburgh Press. She has received the Agnes Lynch Starrett and Pablo Neruda Poetry Prizes, among other honors. Prosody co-host and co-producer Ellen Wadey has worked with the show since 2001. Staffers Michelle Stoner and Lisa Alexander are the program's engineers and editors. 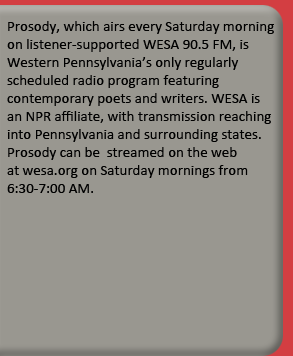 Laurin B. Wolf is a poetry co-host for Prosody.